Recently I’ve been working with the combination of Reactive Streams (in the form of Akka Streams) and Kafka, as it’s a good fit for some of the systems we’re building at work. I hope it’ll be beneficial to others to share a particular nuance I discovered whilst working with this combintion, in particular a problem with slow downstream consumers. To give a brief overview, we were taking messages from a Kafka topic and then sending them as the body of http post requests. This was working fine for the majority of the time, as we only get a message every couple of seconds normally. So what happened? We saw a lot of rebalancing exceptions happen in the consumer, and also because we were using non-committing Kafka consumers, all the messages from offset 0 were constantly being re-read every second or so as a result of the constant rebalancing. Also when you try and use the kafka-consumer-groups script that comes with Kafka, you don’t get a list of partitions and consumers, but a notification that the consumer group either doesn’t exist or is rebalancing. It turns out, Kafka was constantly redistributing the partitions across the 2 nodes within my affected consumer group. I can’t recall how I eventually figured this out, but the root cause was combining kafka in a reactive stream with a slow downstream consumer (http). At the time of writing we’re using akka-stream-kafka 0.11-M3, and it has an “interesting” behaviour when working with slow downstream consumers – it stops its scheduled polling when there is no downstream demand, which in turn stops its heartbeating back to Kafka. Because of this, whenever the stream was applying backpressure (because we were waiting on http responses), the backpressure propogated all the way back to the Kafka consumer, which in turn stopped heartbeating. Then I used this code to publish messages onto Kafka, and ran two of these consumers to consume in parallel within the same Kafka consumer group. What this causes the Kafka broker to do (at least with its default configuration) is to consider that node as slow or unavailable, which triggers a rebalancing of partitions to other nodes (which it deems might be available to pick up the slack). That’s why when I kept reviewing the state of kafka-consumer-groups, you’d eventually see all partitions being consumed by one node, then the other, then getting the rebalancing message. And because both of our nodes were using non-committing consumers, they both kept receiving the full backlog of messages, meanining they both became overwhelmed with messages and applied backpressure, which meant Kafka kept reassigning partitions… it was a vicious cycle! Consumer group `test-consumer` does not exist or is rebalancing. So how did we fix this? Thankfully for us we knew that the number of elements ever to appear in a batch would be small (few hundred elements) so we added an in-memory buffer to the stream, which meant we could buffer all these for the http endpoint to eventually process and Kafka would be unaffected. This was a quick fix and got us what we needed. Is it the right fix? Probably not, if we were dealing with greater volume or velocity we’d have to treat this app as a slow consumer, and possibly ditch the reactive streams abstraction in favour of utilising the lower level Kafka API to ensure we had full control over our partition and heartbeat management. But that constitutes a dedicated article(s) in its own right. I hope someone else finds this useful, one of the mishaps you can have when you abstract so far away you don’t realise the issues that could occur beneath the woodwork. The next set of Articles are documenting a presentation I’m working on to demonstrate Continuous Delivery, and how in a world where CD is desired, it’s becoming increasingly important for the appropriate level of testing to happen. I’ll be breaking them down to tackle one topic at a time, finally building up to a full demo on how I feel CD can work. 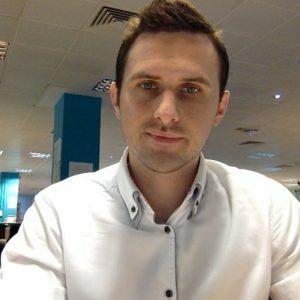 Firstly, I’m going to start with a problem CI/CD can address – Performance Testing. Not so much on how to performance test or how CI/CD can build systems that don’t require it, but how a continuous delivery pipeline can quickly alert developers to potential problems that could otherwise remain undetected and take ages to debug once in production. Side-bar: The demo project for this article was originally ported from the spring boot data rest example within their samples, however the @Fetch annotation appears to be ignored, which makes it difficult to demonstrate. I suspect the spring boot configuration doesn’t use the Criteria API behind the scenes, which means the @Fetch annotation will be ignored. So at this point, I have a simple application whose performance can be altered by simply changing the @Fetch annotation, but how can we test the effect of this? Side-bar: Gatling also comes with is a recorder UI. This allows you to record all interactions with applications over HTTP and save them as scenarios. 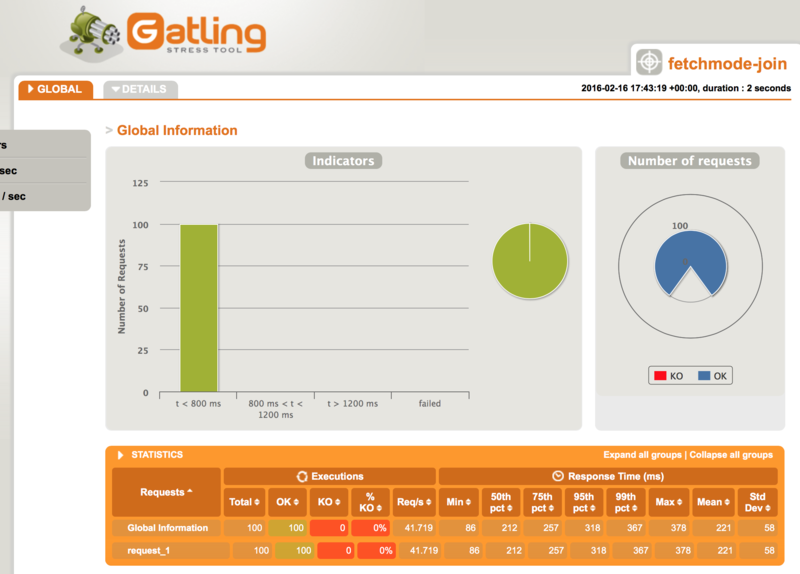 Gatling achieves this by acting as a proxy, which you can use like any other web proxy. You can route web browser or application traffic via the Gatling Recorder Proxy, and it will record all interactions made through it and save them as a scenario similar to the one above, which can then be tweaked later. N.B. I’ve warmed up the DB cache before running both the before and after benchmarks by running the simulation once before I’ve recorded the results. 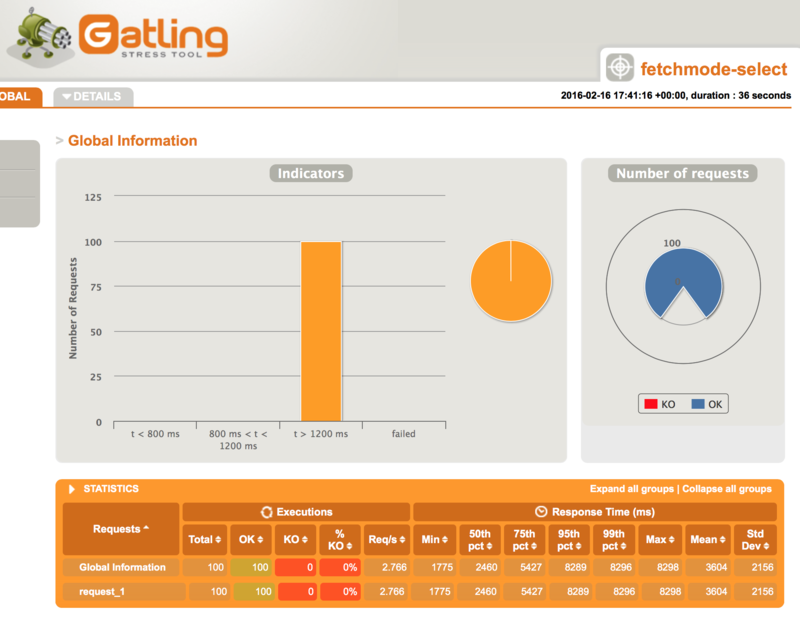 The average response time has increased from 221ms to 3.4 seconds, with the 95th percentage rocketing up to 8.3 seconds! Something as simple as an annoatation change can have such a dramatic impact on performance. The worrying thing is this is so easy to do: it could be done by someone unfamiliar with Hibernate and database performance tuning; by someone frantically looking to find some performance gain and changing a number of things arbitrarily; or what I consider worse – someone who believes that the benefits of doing this outweigh the performance knock, but fail to gather the evidence to back it up! Over the past few days I have been looking into monitoring Scala and Akka applications, as a number of new integration projects at work are using this framework. Scakka is designed to allow easy building of concurrent applications, and is a great middle-ground for transitioning from OOP to a functional-based approach. AppDynamics (http://www.appdynamics.com): An Application Performance Management tool, capable of providing detailed analytics of a system, not just for the JVM but a variety of technologies, single apps or distributed interactions across a network. Disclaimer: AppDynamics has saved my bacon in the past on a previous project, providing detailed insight to a concurrent system which was suffering from performance issues. Needless to say I’m a little biased to it but still interested to see what else there is out there. So I started off with AppDynamics, as that was familiar ground and suspeted it wouldn’t be too much effort given my previous experience with it. I used the latest version at the time (4.1), and setup the Controller in a VM. This was fairly straightforward as usual (although it takes quite a while) and after this I downloaded a Java Agent and hooked it up to my app using the -javaagent VM argument. Sometimes you’re lucky, and AppDynamics will just detect everything going on in your app straight away… This wasn’t one of those times. No metrics appeared for any Business Transactions, and the App overview looked very bare. Digging into the App Servers list however showed that my app had indeed been registered, and when I clicked on the Memory tab I could see that memory usage was being monitored. Ok, so I’m guessing AppDynamics wasn’t able to detect any entrypoints, as the app establishes it’s own outward connections, so nothing from the outside initiates connections to it. I also couldn’t use any of the automated instrumentation that the Spring framework benefits from either. I got around this by adding some custom POJO instrumentation, by monitoring any objects that implemented the Actor class, and listening for invocations for the aroundReceive method. Splitting the transactions by the simple class name gives a breakdown per Actor type. If necessary you could go a level further and split by message type, but I felt this was a bit OTT to start with. From here, you get high level metrics about each Actor, such as response times, calls per minute, error rates, each accompanied by historical sparklines. Double Clicking each of the Business Transactions provides very detailed information, from a graphical view of interactions (i.e. http calls made) right down to elapsed time at method level. AppDynamics’ ability to track errors logged using SLF4J pretty much gives me everything I’d like from a app monitoring perspective, however there are a couple of drawbacks. Firstly there is a free version, but it limits you to storing 24 hours of data, and you can only track 1 JVM instance with it. This makes it very limited if you wanted to monitor interactions acreoss a number of co-ordinated microservices. AD’s default refresh rate of metrics appears to be a minute, although this may be configurable. This might not be realtime enough for some people but hasn’t been a problem for me. Secondly I tried using the Kamon stack to see what compareable metrics I could get from my app. The benefits from this stack are that as it’s free (as it’s open source) and as it’s modular you can mix and match many of the components within it. For example, you could use a different metrics aggregator (instead of StatsD) or a different dashboaring tool (instead of Graphana), or you can embed it within your own app monitoring framework. As it’s open source it shouldn’t be too difficult to write your own extensions to give you extra functionality. I used the following example stack (https://github.com/muuki88/docker-grafana-graphite) that all runs within a single Docker app and makes starting up and tearing down a breeze. 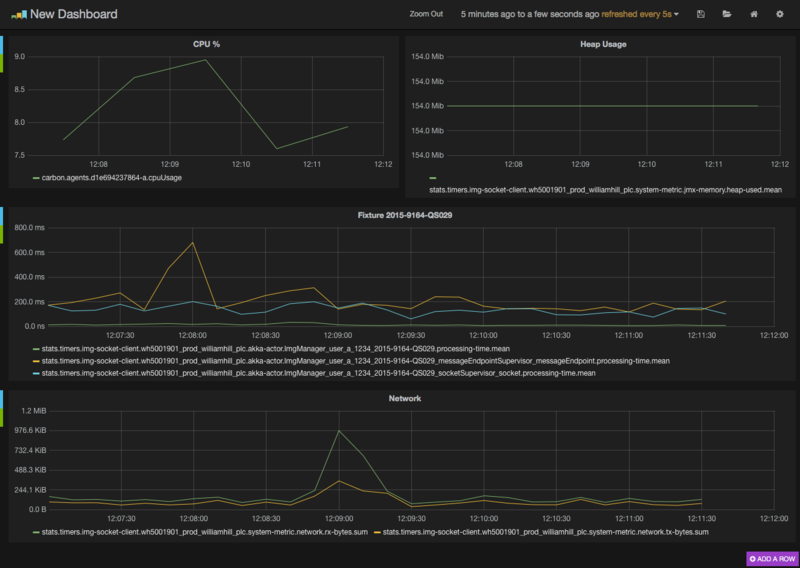 From what I’ve seen this appears to be the standard platform for monitoring Akka so far. Once this was running and posting data to StatsD, I connected to the Graphana app on the webapp port advertised by docker (use “docker ps” to find out what this is) and started playing about with what was available. Firstly I created a row by selecting the button on the left, added a chart, and then started looking through all the metrics that were available. Most of them appear under the stats.timers hierarchy, and are collated under your app name (which is declared within the Kamon configuration in your app’s config file, under the kamon.statsd.simple-metric-key-generator.application element). The Akka-specific metrics live under the akka-actor section, and is constantly updated with your Actors as the system creates new ones. I didn’t like how Graphana didn’t know what scales or format to use for any of the metrics, this had to be done manually. I suspect this is because there’s no metadata about the metrics available, which is understandable given it’s a pretty generic framework for aggregating whatever metrics you want. For example, When adding the processing time, it doesn’t provide any suggestions, and leaves you to pick between seconds, milliseconds, nanoseconds etc. Given I didn’t know at which level Kamon was recording these made it difficult to pick the right one! Kamon doesn’t currently provide much in the way of metrics, although I’m sure that’s set to increase with future releases. Alongide the system metrics (i.e. CPU, memory, heap usage etc.) it provides, Kamon specificically monitors Akka so it can give you informtion on processing time, time spent in mailbox etc., which may be more useful than AD as it only provides generic metrics. Along with the few Akka metrics already available, another one I’d like is messages processed, so I can see if an Actor is getting swamped or processing more than it should. For now, I think I’ll be sticking with AppDynamics – yes it’s more heavyweight (needs a dedicated VM) and not free, it provides more than enough information for me to make informed decisions about an applications performance or issues. When I need to monitor more than one microservice simultaneously however I might need to look elsewhere. Then again, it’s quite likely that my lack of knowledge with the Kamon stack has limited my understanding of its potential. If anybody has examples or suggestions on how it can be better refined to monitor these kind of applications please comment below, it would be greatly appreciated! So recently I have been looking into using Docker to automate parts of my testing and deployment, Using my lightweight CEP component (https://github.com/foyst/smalldata-cep) that uses Siddhi under the covers as a basis to develop my skills in Continuous Integration / Deployment. Currently using Windows 10 on my personal laptop and never one to give up a challenge, I finally got Docker Toolbox running on Windows with version 1.8.2, with boot2docker and Docker Quickstart Terminal. My next goal was to configure Docker builds directly to my boot2docker VM using Spotify’s Docker Maven Plugin (https://github.com/spotify/docker-maven-plugin) as a step towards Continuous Integration / Deployment. The idea being whenever I run the deploy phase of my Maven build, a Docker image of my software would be built, ready to run immediately afterwards. Reading the Spotify Docker readme on GitHub states that it uses the DOCKER_HOST environment variable to determine the location of the Docker Daemon, and if this isn’t set it uses localhost:2375. So I tried setting this to the IP of the VM. 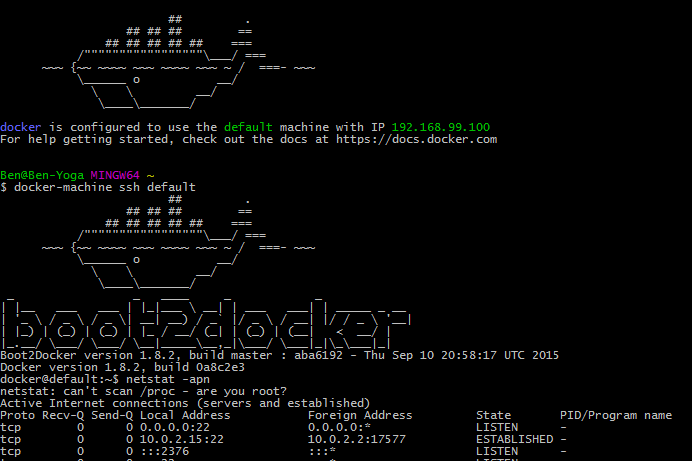 Docker was actually listening on 2376, not 2375! So after changing this I got back to the Socket write error from previous attempts. A quick Google for this brought a bug up for the plugin (https://github.com/spotify/docker-maven-plugin/issues/51), mentioning other environment variables that potentially needed setting up, but at this point I didn’t know if they’d fix my specific problem, or even if they did what to set them to. This allowed my to actually configure the shell of my choice (Powershell), and knowing how that worked I could then apply the same to my IntelliJ configuration. 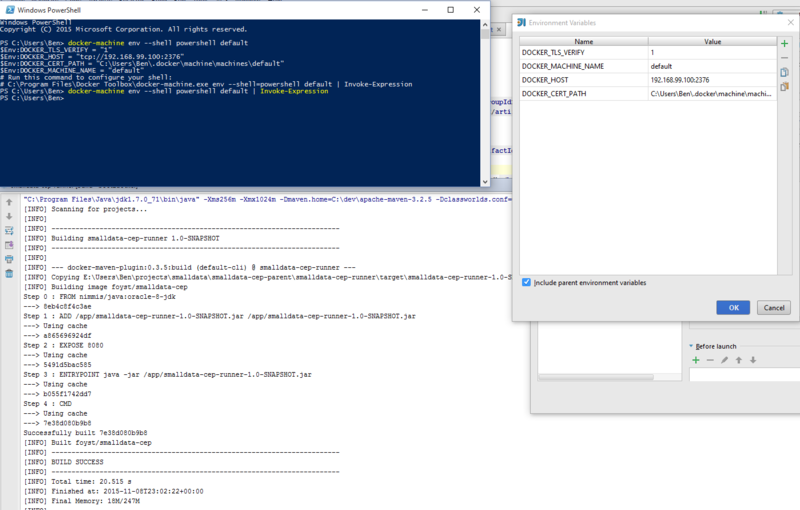 Using Docker in Windows is still quite a PITA, but now the client works natively on Windows and you understand what goes on behind the scenes it’s possible to get it working quite nicely. So after a couple of hours fighting trying to get the latest Docker Toolbox (1.8.2b) installed on my Windows laptop, I thought I’d share my adventure! tl;dr – disable ALL of your security software whilst installing. COMODO’s HIPS module was preventing changes being made to the file system, even though I thought I’d closed COMODO (right click and close) it was still interfering. Disabling this explicitly through the UI allowed me to install Docker Toolbox. After clicking OK the installer drops out, and I get another request from COMODO for the Docker install to modify a file. So after repeating this frustrating loop a couple of times, I turned off COMODO internet security by right clicking the COMODO icon in the notifications area, and selecting Exit. This allowed me to get a bit further in the install right up to starting the install process. 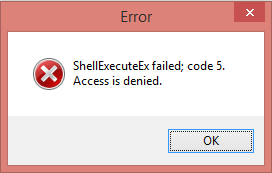 MoveFile Failed Code 5 Access Denied – whilst trying to configure the uninstaller for Docker (the first thing that the installer does). So I aborted at this point and googled for that error message. Nothing specific to Docker, however as I suspected it’s quite a general error message, which returned support posts for a number of other app installs all suffering the same issue. And they all confirmed the same thing – disable your anti-virus and security software. Just to double check, I tried installing the Toolbox within a Windows 8.1 VM I use for specific development (and with no security software installed), and of course it was fine in there.